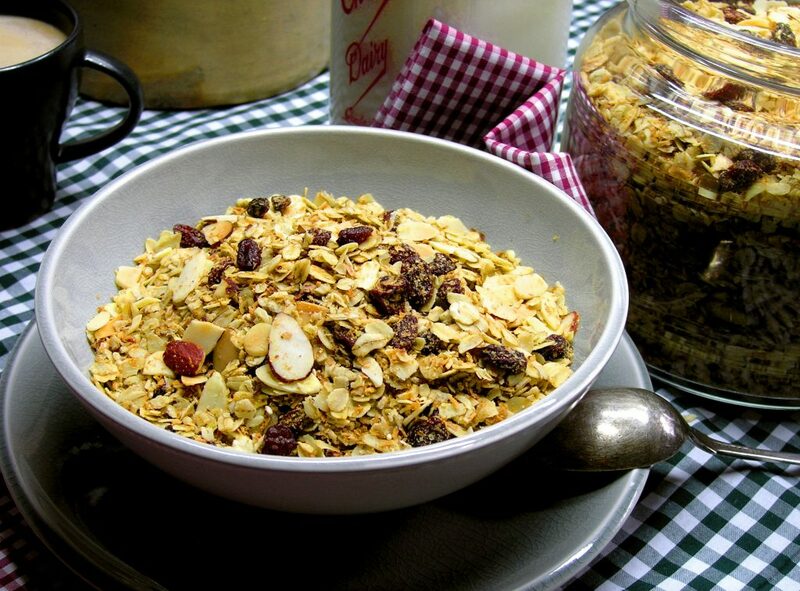 It is much less expensive to make your own granola. Healthier too, as you are in control of what sugars and fats and how much of them is going into it. Also you may vary the nuts and seeds to suit your taste. In a large bowl (I mean LARGE) combine oats, shredded coconut, nuts, seeds, bran, germs. In a small saucepan heat together butter, maple syrup, vanilla, cinnamon until ghee or coconut oil melts. Poor butter mixture over the dry ingredients and stir thoroughly to distribute completely. Transfer to a large roasting pan or a baking dish (min 15 X 11 inches) and bake in 350F oven until evenly golden for 50-60 min, stirring periodically. In a pan, fry dry raisins with 2 tbsp of ghee over low heat for couple minutes, until almost all raisins bloat. Transfer raisins to the hot granola, stir them in to distribute evenly. Makes about 5,5 L of granola. Thanks a lot for the recipe. I made it but the taste is a bit bitter. Could you please let me know hat I can do to avoid this? Alla, bitter taste may be contributed to burnt raisins. Do not bake them, just fry them a bit in ghee on a low/medium heat and add them to the rest of the ingredients at the very end, after you remove your granola from the oven.